Taking Tea with Catherine: I Can Has Shepherd's Pie! I Can Has Shepherd's Pie! I was curious, then, about Teany's Shepherd's Pie. Would the vegetarian version make a decent substitute? Why yes, it would! It was really all I needed, though I also had the lentil soup, which was good but a bit rough on the system later on. Yes, on a November day, it was more than acceptable, and cozy. That's good, because after a traumatically crowded visit to Whole Foods, I needed comfort food (yes, I earn the Moron of the Day Award for going to a normally overcrowded grocery store the day before Thanksgiving.) Bathy thought the SP was rather nice too. I hope I've made the point that not every tea room is all about pretty china and frilly tablecloths (not that I mind those things, but you have to want variety here and there if you live in NY). 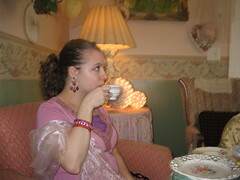 On the subject of tea rooms, I must add that the Teanychino is one of the best ways to drink Mate. Normally, I'm not a fan of Mate as a drink, but this is a subtle way to enjoy it. It's got almond and vanilla and some flowery bits, which covers up the "swill" factor I find in most Mate. By the way, it's not pronounced to rhyme with gate, more like mah-tay. I'd still like a cheeseburger, though. At least I was able to hold off this craving for yet another day. Glad you had fun w/Bathy. fantastic photo! i wanna be there! That pic is actually the blog's title photo (I haven't figured out how to resize it, but kinda like it big), and it's Sympathy for the Kettle. I like the photo too...use picasa to resize. I could actually go for a cheeseburger right now...the kind you get at a diner w/ fries. Mmm. Yes, tea rooms don't have to be all frilly - like they always say variety is the spice of life. You don't KNOW how many times I've wanted to stomp off to a diner and get a cheesburger deluxe with a vanilla milk shake. That's digestive suicide for me, though somehow I survived taco beef Saturday. I'm waiting for the right time (of month?) to go for the whole deluxe. It has to be totally worth it.